Just like with the Western zodiac that is based on your birth month, there are certain characteristics attributed to people born in each lunar year. For example, I was born in the year of the monkey, which supposedly makes me mischievous and clever. Also, each year’s animal influences what happens to everyone during that year. 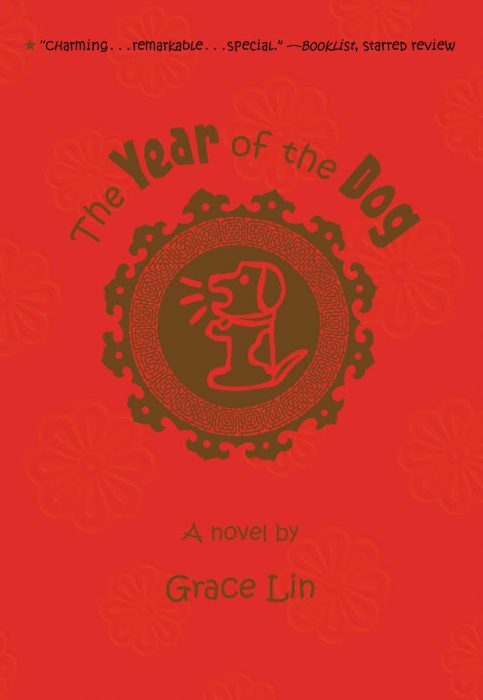 In The Year of the Dog by Grace Lin, the main character, Pacy, learns about what to expect from the year of the dog: Because dogs are loyal, it will be a year dedicated to friends and family; and because dogs are sincere, it will be a good year for thinking hard and finding herself. Immediately, Pacy vows that she will discover her true calling before the year is over — and hopefully it’s tied to a way to get rich! Over the course of the year, Pacy also makes a new best friend, navigates her feelings about being Taiwanese-American, and deals with the ups and downs of regular school stuff (like the Halloween costume contest and the science fair). In other words, the book is a snapshot of a pretty relatable year. But I love that it is all through the lens of Pacy’s Taiwanese heritage and what the year of the dog means to her and her family. This book is aimed at younger readers than some of Grace Lin’s other novels (like Where the Mountain Meets the Sea and Starry River of the Sky). So if you’re a super fan of those books, then you might find The Year of the Dog doesn’t hold your attention in the same way. (Also, there are no fantasy elements in Pacy’s life!) But I’d recommend this book for fans of Rickshaw Girl by Mitali Perkins and Andrew Clements’ school stories (like Frindle and Lunch Money). And don’t just take my word for it — check out these positive reviews from Jackson (age 10) and Tammy (age 10)! Do you celebrate lunar new year at home, or did you mark the occasion at school? Leave a comment about what you did to welcome the year of the dog! In addition to being quick-witted, people born in the year of the monkey are also supposed to have a competitive spirit. This seems to be true of Karen on board game night!